William Alan Reinsch holds the Scholl Chair in International Business at the Center for Strategic and International Studies (CSIS) and is a senior adviser at Kelley, Drye & Warren LLP. 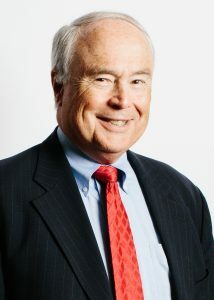 Previously, he served for 15 years as president of the National Foreign Trade Council, where he led efforts in favor of open markets, in support of the Export-Import Bank and Overseas Private Investment Corporation, against unilateral sanctions, and in support of sound international tax policy, among many issues. From 2001 to 2016, he concurrently served as a member of the U.S.-China Economic and Security Review Commission. He is also an adjunct assistant professor at the University of Maryland School of Public Policy, teaching courses in globalization, trade policy, and politics. Reinsch also served as the Under Secretary of Commerce for Export Administration during the Clinton administration. Prior to that, he spent 20 years on Capitol Hill, most of them as senior legislative assistant to the late Senator John Heinz (R-PA) and subsequently to Senator John D. Rockefeller IV (D-WV). He holds a B.A. and an M.A. in international relations from the Johns Hopkins University and the Johns Hopkins School of Advanced International Studies respectively.